Driven by the development of biomass fuels for electricity production at home and overseas, the economics of wood fiber for animal bedding have made sand and digestate more attractive options, with digestate produced on the same holding or nearby often being both cheaper and easier to obtain than sand. However, using digestate in this manner still requires some processing. This often involves composting or drying in order to use fresh digestate, while the liquid fractions are applied to soils as fertilizer. 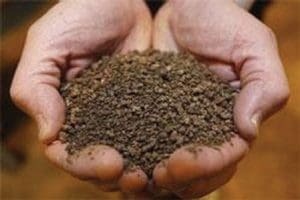 While using digestate as livestock bedding is cheap and convenient, in terms of nutrients, carbon footprint and energy use, it is far from an ideal solution. Depending on the feedstocks used, one ton of digestate can contain1: 6 to 60 lbs. of nitrogen, 1 to 22 lbs. of phosphorus, 4 to 30 lbs. of potassium, as well as sulfur, magnesium and valuable trace elements such as zinc, copper and nickel. Some of these nutrients will remain in the bedding after use (and indeed the livestock will add further nutrients), but many will be leeched out and wasted. Drying digestate uses large amounts of fuel (and carbon) and drives off water that could be used elsewhere (for example, added back to the feedstock at the start of the digestion process to improve mixing). There are better ways to remove water from the dry fraction of digestate, and also higher value uses for the digestate itself. 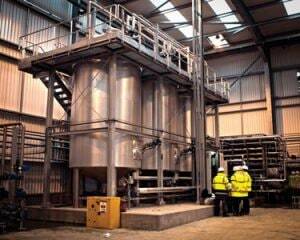 A Digestate Concentration System (DCS) from HRS Heat Exchangers in use at a UK wastewater treatment AD plant. Photos courtesy of HRS Heat Exchangers. The main use of digestate around the world is as an organic biofertilizer in agriculture. Where biogas plants are producing large quantities, this makes sense, particularly if the liquid fraction can be distributed and applied around the farm using irrigation infrastructure. As fertilizer prices continue to rise, the ‘free’ nutrition in digestate becomes increasingly attractive to growers. The EPA2 confirms that applying digestate to land can improve soil health by increasing organic matter, reducing soil erosion and nutrient run-off, alleviating compaction and reducing the need for chemical fertilizers and pesticides. Depending on the feedstocks used (such as energy crops, livestock manures, and food or garden waste), and the crops to which the material is being applied, the feedstock or digestate will first need some form of treatment to prevent the transmission of plant and animal disease organisms, or those which could harm human health (such as E. coli). There are different treatments available, but some form of pasteurization is the most commonly accepted and used technique. Where digestate is being turned into other high value products, such as compost or as a soil improver for home gardens or commercial horticulture, then the need for such treatment is even more important. Scientists around the globe are also working on other uses for digestate, such as nutrient extraction, algae production, biopesticide production and even to create building materials. Two separate but complementary systems for the treatment of digestate have been developed.3 The first—the digestate pasteurization system (DPS)—uses highly efficient heat exchangers, together with two or three holding tanks (depending on project size and digestate volume). Using heat exchangers for pasteurization is more efficient than using tanks with heating jackets as they have a much lower heat requirement—up to half of that of some systems. This is because tank systems have lower heat transfer efficiency and usually dump the hot water after use, rather than reclaiming it. Using heat exchangers means that effective pasteurization of digestate—for example, to meet state and federal regulations—is possible using surplus heat from elsewhere in the AD plant (such as the CHP unit), rather than needing to install an additional heat source such as a biomass boiler, which could add hundreds of thousands of pounds to a project. Concentrated dry digestate, which is free from potential pathogens, has much more potential as a high value product. Using a well-designed heat exchanger system can provide a continuous pasteurization process which uses less energy than alternative systems, while allowing additional thermal regeneration, or recovery, levels of up to 60 percent. This saved heat can then be used elsewhere, such as in an evaporation plant. A digestate concentration system (DCS) uses heat to separate water from digestate by concentrating. This technique can reduce the overall quantity of digestate by as much as 80 percent, greatly lowering the transport costs associated with its removal. A typical 3.4 million BTU wastewater AD plant could produce 44,000 tons of liquid digestate every year, so the savings in storage and transport requirements are significant. A well-designed concentration system will include measures to retain the valuable nutrients in the digestate, while the evaporated water can be condensed and reused. For example, the captured water can be added back to the feedstock as it enters the digester, making the entire process almost self-sufficient in terms of water use and eliminating liquid discharges from the plant. After concentration, the treated digestate dry solid content can be as much as 20 percent (often a four-fold improvement), making it much easier to transport and handle, while nutrient content is also increased. 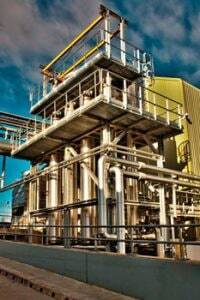 The trend for sewage plants to add biomethane upgrading technology is increasing. As with any equipment, adding processes to an existing AD plant involves investment costs, but it is vital to compare like-with-like and to compare the value of the investment, not only with alternative systems, but also with the costs of doing nothing. Some of the key questions to ask when evaluating different technologies include: What is the overall energy cost over the life of the unit? What are the downtime or efficiency penalties associated with batch-treatment processes? What effects does the technique have on the composition of the digestate? How much will storage and handling cost over the life of the project? There are many other issues to consider, but as these few examples indicate, the cheapest solution in terms of capital outlay may not be the cheapest over the life of an AD plant, particularly if you have to invest in additional storage tanks or generate additional heat in order to service it. Matt Hale is International Sales and Marketing Director for HRS Heat Exchangers (Phoenix, AZ and Atlanta, GA), which operates at the forefront of thermal technology, offering innovative and effective heat transfer solutions worldwide, across a diverse range of industries. With more than 35 years of experience, HRS specializes in the design and manufacture of an extensive range of tubular, corrugated and scraped surface heat exchangers. All products comply with global standards. HRS has a network of offices throughout the world: Spain, USA, Malaysia, Australia and India; with manufacturing plants in the UK, India and Spain. For more information, call (770) 726 3540 or e-mail info@us.hrs-he.com or visit www.hrs-heatexchangers.com/us/. Lukehurst, C. Frost, P. & Al Seadi, T. Utilisation of Digestate from Biogas Plants as a Fertiliser. IEA Bioenergy. June 2010. http://americanbiogascouncil.org/adCoProductsResources/IEA_digestate_Use_manual.pdf. Developed by HRS Heat Exchangers.